Connor's got the big cast on him and we're all finally back at home. 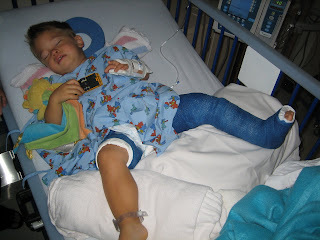 The cast went on with no problems, and Connor got through the procedure and we were back in his room around 2:00pm. The plan was to give him some food orally since he hadn't had anything but IV fluids since 10:00pm the night before. Connor had other plans though. He hadn't gotten a nap on Sunday before he broke his leg, and didn't sleep well overnight. He had a little bit of juice in the PACU area, but after we got back to his room, he refused to eat and fell asleep. We decided to let him rest and waited until around 5 or 6 until we tried more food. He didn't want it, but he did eat some and proved he could stomach some food, fluids, and very importantly his pain meds. He's prescribed a mix of Roxicet, Valium, and Motrin. He still seemed to be in some pain, and would spasm in his sleep, but it's getting better and better. Grandpa and Grandma Anders had to leave after Connor got back from the OR, and the Rudolphs came to visit later in the afternoon. Connor was somewhat alert and he enjoyed playing with all the cars and trucks they brought. We got a new extra wide car seat and with Jessica's (Andrea's cousin) help we got it set up and into the car. 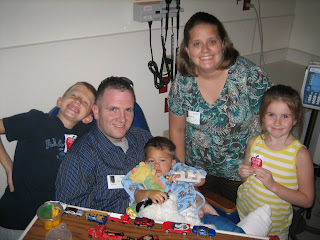 We filled out the discharge paperwork, and finally the nurse removed the IV from Connor's arm. They originally had put it in the inside of his right elbow, which he never minded too much. Before the surgery they decided that it would be more comfortable in his left hand, but Connor absolutely hated that. After coming back from the OR, he clawed at it and complained about the IV more than anything. About 7:00 pm, we discharged and Jessica helped us get everything out of the room and to the garage. We got home and Connor ate a little bit of fruit before we put him down for the night. He fell asleep quickly and I'm getting ready to check on him in the next few minutes. Every few hours he has to be adjusted so the pressure points are redistributed and his diaper needs to be changed. He also needs to drink a little juice if he's willing and take some more pain medicine. After I put Connor down I ran out to Walmart to pick up a bean bag for him to sit in while he's in the cast. They didn't have any, but I got him a few things at Walmart and then went to Target to see if they had any bean bags. They did, but only in pink and purple. I decided that function was more important than form and I got him a pretty purple bean bag with embroidered flowers. I'm sure he'll love it. When I was checking out at Target I realized that I'd taken the cash envelope out of my wallet at Walmart and although I put the cash envelope back in my pocket, I'd left my wallet at Walmart. I hurried back to Walmart and thankfully someone had given the wallet to customer service. I am ridiculously tired, and not too surprised I made the mistake. I'm thankful there are some good people left in the world. No credit cards or cash missing even. To finish this post, here's a video of Connor sitting with Uncle Nate. It's the first time I caught him doing his "Siren" sound effect on camera. It sounds about like: "Oooooo bah boosh"
Very nice to see all these posts. Keeps us long distance folks up with what's going on. We're all very interested.